I was interviewed by The Gal in the Blue Mask as part of her 31 Days of Horror. If you don’t want to read an interview with me, there’s PLENTY of other stuff from those 31 days, so check it out. I did a werewolf roundtable discussion with Ray Garton, Jonathan Janz, and Glenn Rofle, organized by John Everson and moderated by W.D. Gagliani. If you like werewolves, and you know that you do, head on over to Not Now, Mommy’s Reading. I’ll be at the Spooky Empire convention in Orlando this weekend, which is screening “Chomp” on Saturday as part of their film festival. Things will sort-of calm down in November. Or WILL they…? JEFF STRAND – The Horror Show with Brian Keene Ep 37 – The funniest person in horror, Jeff Strand, sits down with Brian and Dave for a serious interview about transitioning to writing full-time, how he met his wife, humor in horror, his work in film, and much more. Plus — The Walking Dead premieres, Jonathan Janz’s monstrous new book deal, Irish rocker Matt Hayward creates the show’s first song parody, and anticipation builds for The X-Files and Ash vs. The Evil Dead. 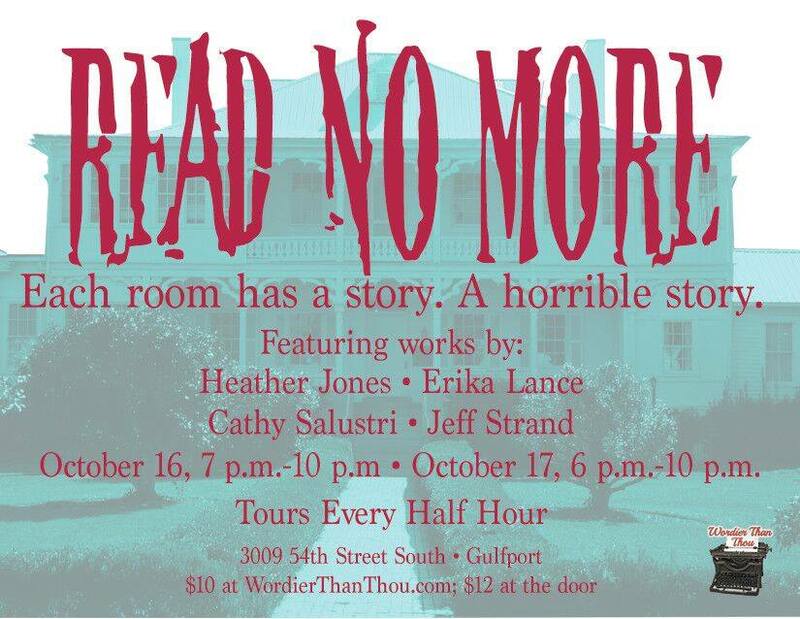 This Friday and Saturday night, in Gulfport, Florida, come on out to Read No More. Each room has a short spooky play (okay, mine is a comedy) to get you into the Halloween spirit. Well, if you’re on this website, you’re ALREADY in the Halloween spirit, but you know what I mean. My evil little contribution stars Hailey Escobar, Christa Jerome, and Jeff Smith, and is directed by Lynne Hansen. The whole event is put together by Tiffany Rizzano of Wordier Than Thou. Nick Cato of The Horror Fiction Review has included The Greatest Zombie Movie Ever in the October 12 update. You always hope to find something quotable in these reviews, and “easily his overall funniest book to date” works for me. Voodoo Sale! Bad Feeling Sale! Everyone who’s met me says, “Goodness gracious, you’re ever so manly!” So when Man Crates asked me to write a blog about what I’d include in a horror movie survival crate, I growled in an incredibly masculine manner and said yes. They offer gifts for MEN in crates that you have to open using a crowbar. Yes, that’s right, you can use a crowbar for its intended purpose of prying open things, instead of just using it to defend yourself against a serial killer. Books. You won’t spend the entire post-apocalypse being chased around by zombies. There’s going to be a lot of downtime. Therefore, it’s important to have plenty of books. Stacks of them. All genres. Deep, meaningful literature and brainless beach reads. Several extra pairs of glasses. We learned the lesson from Burgess Meredith in that Twilight Zone episode–the apocalypse doesn’t do you any good if you break your glasses. And you need more than one extra pair, because any decent apocalypse is going to be chock full of opportunities to break your glasses, so pack as many pairs as you can fit into that crate. Audiobooks. Eventually your eyesight is going to deteriorate to the point where large-print books won’t cut it. Or (and it’s unpleasant to think about) a zombie will eat your eyeballs. You don’t want to be moping around the post-apocalyptic landscape, cursing your hollow eye sockets. If you’ve got plenty of audiobooks, you can avoid the ironic twist. A raconteur. Audiobooks require a source of power. At some point, you’ll use up all of your batteries, and your generator will run out of gasoline. So you’ll need a skilled storyteller to keep you entertained. Certainly there are moral issues involved with keeping a human being in a crate, but after the apocalypse, these things won’t be regulated. Food. Make sure your reading needs are taken care of first, but, yeah, I guess you’d better have some food. Wow, that was almost TOO manly, wasn’t it? If you’re a man, or know any men, get over to Man Crates and order some manly stuff. Rrraarrr!!!! Would I rather be completely hairless, or have hair that grows so fast that I need a haircut every single day? It’s a question lots of readers have asked me. The question gnaws at them. Haunts them. Keeps them up at night, staring at the ceiling, desperate for the sweet release of sleep. So I’ve finally answered it on Chapter by Chapter: A Mostly YA Blog. It’s part of a guest post by Suzanne Brockmann and Melanie Brockmann, where they talk about their new book Wild Sky. Find the answer you seek HERE.